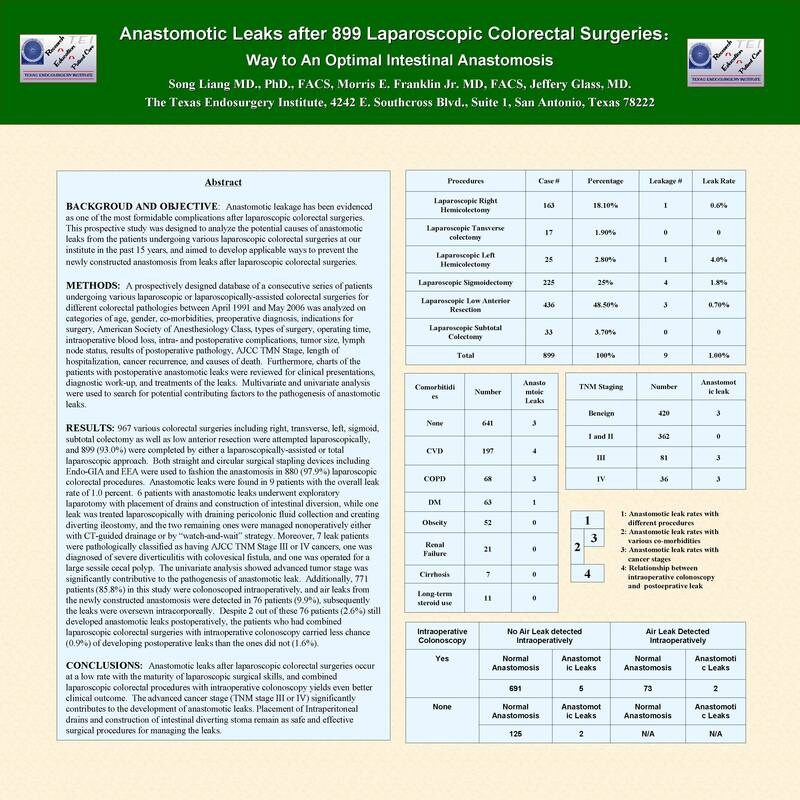 BACKGROUD AND OBJECTIVE: Anastomotic leakage has been evidenced as one of the most formidable complications after laparoscopic colorectal surgeries. This prospective study was designed to analyze the potential causes of anastomotic leaks from the patients undergoing various laparoscopic colorectal surgeries at our institute in the past 15 years, and aimed to develop applicable ways to prevent the newly constructed anastomosis from leaks after laparoscopic colorectal surgeries. METHODS: A prospectively designed database of a consecutive series of patients under-going various laparoscopic or laparoscopically-assisted colorectal surgeries for different colorectal pathologies between April 1991 and May 2006 was analyzed on categories of age, gender, co-morbidities, preoperative diagnosis, indications for surgery, American Society of Anesthesiology Class, types of surgery, operating time, intraoperative blood loss, intra- and postoperative complications, tumor size, lymph node status, results of postoperative pathology, AJCC TMN Stage, length of hospitalization, cancer recurrence, and causes of death. Furthermore, charts of the patients with postoperative anastomotic leaks were reviewed for clinical presentations, diagnostic work-up, and treatments of the leaks. Multivariate and univariate analysis were used to search for potential contributing factors to the pathogenesis of anastomotic leaks. RESULTS: 967 various colorectal surgeries including right, transverse, left, sigmoid, sub-total colectomy as well as low anterior resection were attempted laparoscopically, and 899 (93.0%) were completed by either a laparoscopically-assisted or total laparoscopic approach. Both straight and circular surgical stapling devices including Endo-GIA and EEA were used to fashion the anastomosis in 880 (97.9%) laparoscopic colorectal procedures. Anastomotic leaks were found in 9 patients with the overall leak rate of 1.0 percent. 6 patients with anas-tomotic leaks underwent exploratory laparotomy with placement of drains and construction of intestinal diverting stoma, while one leak was treatedwith draining pericolonic fluid collection and creating diverting ileostomy laparoscopically, and the two remaining ones were managed non-operatively either with CT-guided drainage or by “watch-and-wait” strategy. Moreover, 7 leak patients were pathologically classified as having AJCC TNM Stage III or IV cancers, one was diagnosed of severe diverticulitis with colovesical fistula, and one was operated for a large sessile cecal polyp. The univariate analysis showed advanced tumor stage was significantly contributive to the pathogenesis of anastomotic leak. Additionally, 771 patients (85.8%) in this study were colonoscoped intraoperatively, and air leaks from the newly constructed anastomosis were detected in 76 patients (9.9%), subsequently the leaks were oversewn intracorporeally. Despite 2 out of these 76 patients (2.6%) still developed anastomotic leaks postoperatively, the patients who had combined laparoscopic colorectal surgeries with intra-operative colonoscopy carried less chance (0.9%) of developing postoperative leaks than the ones did not (1.6%). CONCLUSIONS: Anastomotic leaks after laparoscopic colorectal surgeries occur at a low rate with the maturity of laparoscopic surgical skills, and combined laparoscopic colorectal procedures with intraoperative colonoscopy yields even better clinical outcome. The advanced cancer stage (TNM stage III or IV) significantly contributes to the development of anastomotic leaks. Placement of Intraperitoneal drains and construction of intestinal diverting stoma remain as safe and effective surgical procedures for managing the leaks.